Prof.dr. 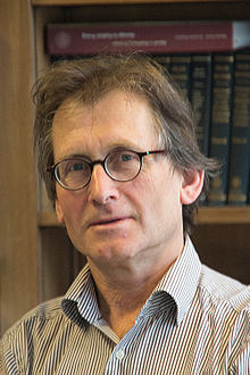 Ben L. Feringa obtained his PhD degree at the University of Groningen in the Netherlands. After working as a research scientist at Shell in the Netherlands and the UK, he was appointed professor of organic chemistry at the University of Groningen. He is currently the Jacobus H. van’t Hoff Distinguished Professor of Molecular Sciences in the Stratingh Institute for Chemistry and holds a position at the University of Groningen Medical School. Stereochemistry, organic synthesis, asymmetric catalysis, molecular switches and motors, self-assembly, molecular nanosystems and photopharmacology. The research group is focussing on functional molecules, dynamic molecular systems and smart materials addressing challenging problems at the interface of chemistry and biology/medicine. The program is highly interdisciplinary in nature ranging from synthesis and photophysics to chemical biology and medicinal chemistry comprising researchers with various expertise and backgrounds (chemists, physics, molecular biology) forming a highly international group (USA, UK, China, Japan, Spain, currently seventeen nationalities). The PhD student will be member of the biosubgroup, a closely cooperating team of PhD’s, Postdocs and master students, in which ambition and initiative are greatly valued.